Dental bridges are fixed dental restorations that literally bridge the gap created by one or more missing teeth. Teeth on either side of a gap are crowned and are used as anchors to support replacement teeth to restore aesthetics and function. It is essential to replace missing teeth as soon as possible to prevent adjacent teeth from moving into the gap and changing the bite. These changes may cause jaw & muscle pain, headaches, cheek/lip trauma and difficulty eating. Anchor teeth are prepared to a desired shape. An impression is taken, and from this the bridge is fabricated by the laboratory. The bridge is then fitted over the supporting teeth and bonded in place using bonding cement. 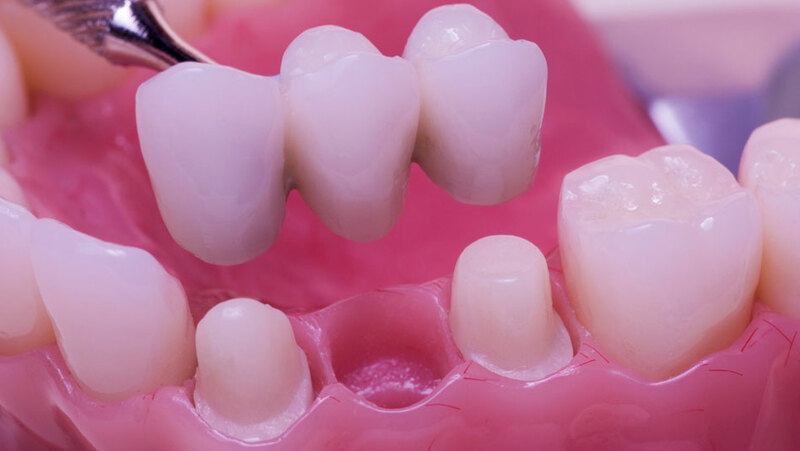 One disadvantage of a bridge is that it involves reshaping of healthy adjacent teeth. For this reason, we use dental implants as an alternative, where appropriate. Bridges, however, remain a viable alternative for patients who are not candidates for dental implants, or when existing bridges are being replaced. To find out about what is best for you, call us on 0395570957 or schedule an appointment.